INDIANAPOLIS — The Hoosier State is at the center of America’s opioid drug abuse epidemic, so it’s up to Hoosiers to figure out how best to combat the scourge and prepare for the next one. 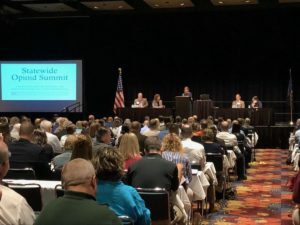 That motivation drew nearly 1,000 judicial, law enforcement, public health and community leaders from all 92 counties to the Indiana Convention Center Wednesday for the state’s first Opioid Summit. During the daylong event, participants learned from state and national experts about the science of addiction, the benefits of medication-assisted treatment, what courts can do to help those struggling with addiction, jail-based treatment options, the effects of addiction on local government services — and the promise of recovery. “To me, it’s unbelievable that we still don’t offer this treatment to everybody. It’s like withholding chemotherapy from cancer patients.” — Dr. Leslie Hulvershorn, medical director at the Indiana Family and Social Services Administration. 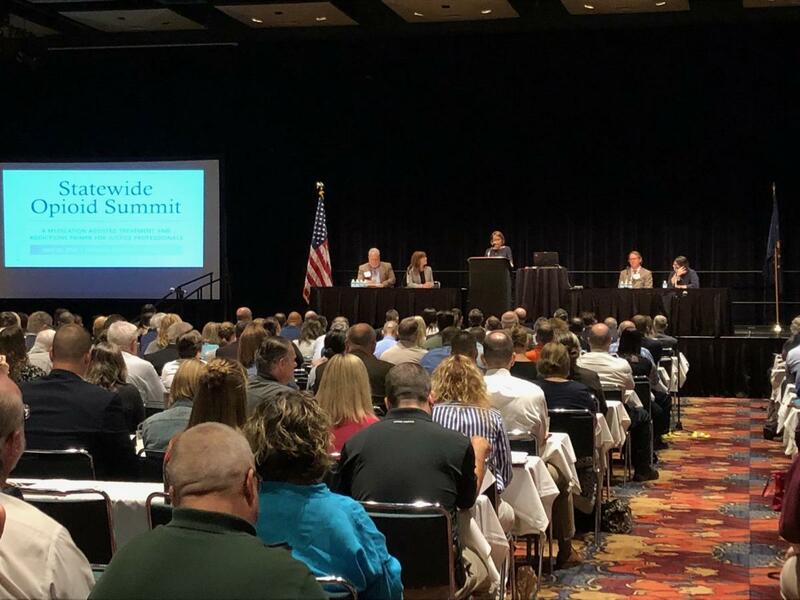 Indiana Chief Justice Loretta Rush, who helped organize the summit, said the addiction crisis sits at the intersection of the law and medicine, with seemingly unlimited effects touching children, families, communities, businesses, courts and the state as a whole. Dr. Leslie Hulvershorn, medical director at the Indiana Family and Social Services Administration, said science shows, without question, that medication-assisted treatment, such as methadone or Suboxone, in conjunction with mental health services, is what’s needed to help people beat addiction for the long-term, and the state and local governments must figure out how to make them available to people in need. FSSA Director Dr. Jennifer Walthall said steps taken by Republican Gov. Eric Holcomb’s administration to make addiction treatment more convenient for more Hoosiers are showing promise in some pockets of the state where previously soaring addiction levels appear to have plateaued. “Not dying is a great first start. But that’s not the end. In fact, that’s just the beginning,” Walthall said. Larry Hesson, president of the Indiana Association of Counties, said no level of government is more affected by addiction than counties, whether it’s first responders, sheriff’s police, the jail, prosecutors, public defenders, the courts or probation. At the same time, he said, communities often are reluctant “to accept the reality of addiction” fearing potential damage to their family-friendly reputations. “The first step in dealing with any problem is to recognize that it exists,” Hesson said. One summit participant well aware of the societal effects of drug addiction was Lake Superior Judge Elizabeth Tavitas, who last week was appointed by Holcomb to the Indiana Court of Appeals. She said the impact of addiction is like a thread running through her legal career, first as a deputy prosecutor, then juvenile court public defender and referee, and, most recently, as a family court judge. As Indiana’s newest appellate judge, Tavitas said she’s looking forward to using her experience as “part of a problem-solving team” that will help Hoosiers overcome addiction. More than 1,500 Hoosiers died due to a drug overdose in 2016, with 785 of those deaths attributable to opioid abuse, according to the State Department of Health.